Look what Preity Zinta just found. It's a picture of her with Shah Rukh Khan from the sets of Dil Se, their 1998 film. Dil Se was Preity's debut film. "Look what I found. Dil Se bus mein," she captioned her post, adding hashtags like '#firstfilm' and '#memories.' Dil Se, directed by Mani Ratnam, is considered as one of SRK's best films. The romantic-thriller also starred Manisha Koirala. After Dil Se, Preity Zinta and Shah Rukh Khan co-starred in hit films like Kal Ho Naa Ho, Veer-Zaara and Kabhi Alvida Naa Kehna. She also made special appearances in SRK's Om Shanti Om title track and Rab Ne Bana Di Jodi song Phir Milenge Chalte Chalte. Take a look at the throwback picture she posted. 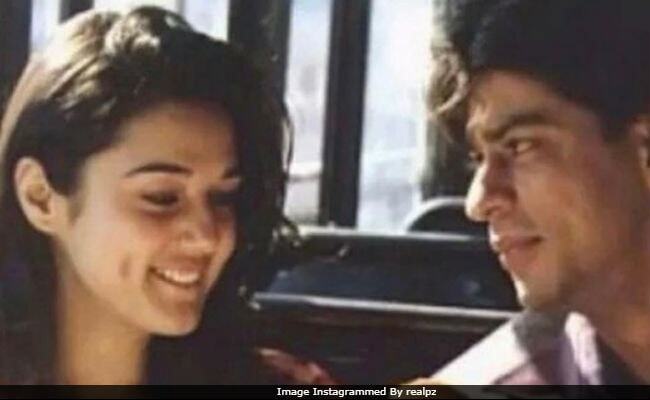 As Veer-Zaara clocked 13 years last November, Preity posted a collage of the film's stills and wrote, "Love has no boundary, no country & no religion. It belongs to everyone with a heart. Which better movie than Veer Zaara to prove it. Thank you Yash uncle for giving me the gift of Zaara and thank you Amitabh Bachchan, Hema Malini, Aditya Chopra, Rani Mukerji and Shah Rukh Khan for an unforgettable experience." Love has no boundary, no country & no religion It belongs to everyone with a heart ! Which better movie than #VeerZaara to prove it. Thank U #YashUncle for giving me the gift of #Zaara & Thank U #Amitji #Hemaji #Adi #Rani & #Srk for an unforgettable experience #13YearsOfVeerZaara. On Shah Rukh Khan's birthday, she posted a lovely picture with the 52-year-old superstar. "Happy birthday to my darling Shah Rukh Khan. Loads of love today tomorrow & always. Thank you for teaching me so much of what I know," she captioned the post. Preity Zinta is married Gene Goodenough since February 2016. She has not made any big screen appearances after 2013's Ishkq In Paris. Preity co-owns Kings XI Punjab, an Indian Premier League (IPL) team. Shah Rukh Khan is the co-owner of Kolkata Knight Riders.